Does Batman kill? 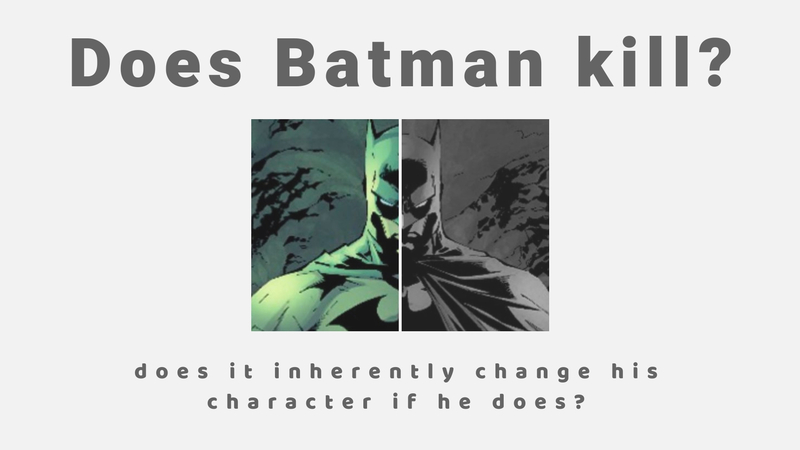 One of the most asked questions about Batman. We know that there are many iterations of Batman, in most of the cases, Batman has a strict no killing rule. There are many story arcs however, which have Batman killing. Often these are else-world stories. If this was to be brought into the main Batman comic, would this change the very being of his character? There are a lot things we identity when it comes to Batman. His parents died in an alley way, he embodies his fear to overcome it, he hates guns and he doesn’t kill. Lots of people kicked up a fuss when Batman v Superman came out. All of sudden we were faced with a Batman who was snapping necks and blowing people up. A radical change from the character we normally see. Did this stop him from being Batman? No it didn’t. He was very much still Batman, but in a different life-stage to what we’re used to him seeing him in. In the main comics we see a Batman who has been at it for a while, but is still young. Batman v Superman gave us an older Batman, who has been through enough to break his moral standing. Why should he continue to live by his self-imposed rules when they’ve gotten him nowhere? 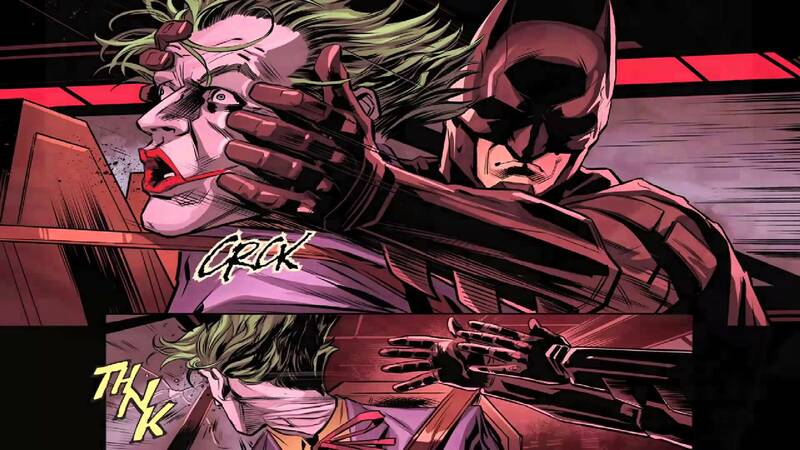 Another question that is often asked after the does Batman kill question is, why doesn’t Batman kill the Joker? Or why doesn’t Batman paralyse the Joker? Well the main reason Batman doesn’t kill the Joker, other than his self-imposed rules is that it would be exactly what the Joker wants. The Joker wants to prove that Batman is every bit the monster that he is, Batman just can’t admit it to himself. Wouldn’t the world be better off without the Joker? Okay so then why doesn’t Batman just paralyse the Joker, incapacitate him so that he can’t do any more harm? To an extent he has done this, captured Joker and sent him to Arkham. But he always seems to find a way out (they clearly have the same security level as Star Labs on The Flash). The thing with the Joker is, that unless you kill him, he’ll find a way out. Sure you can say, why doesn’t Batman cripple the Joker? But you know what, Joker will probably manipulate some poor sucker to be his legs, and carry him around whilst he causes chaos. That’s how much of an unstoppable force Joker is. If he was able to make sweet Dr. Quinzel turn into a maniac, who knows what else he’s capable of. So yeah the only option is to kill the Joker, and that would be reaffirming everything Joker stood for. Batman is way too stubborn to do that. Back to the main topic, does Batman kill? No, except for the exceptions. Does it inherently change the nature of his character if he kills? No. Because Batman is a complex guy, and its all to do with context. If he starts killing innocent people for the heck of it, then yeah, he’s changed. But if its a case like Batman v Superman, then that’s a different story. 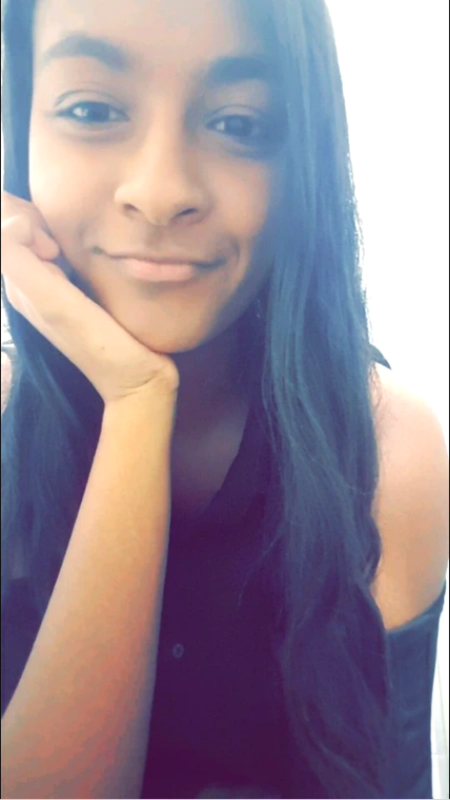 How would you like it if you lived your life by a certain set of rules, that you convinced yourself was the only way to go, only to live a failure after failure? Would you stick by those same rules? Even though the outcome is the same? Probably not, you would probably change your methods to see if the result changes. Batman cracked. He isn’t the tough shell he portrays to be. He’s still that same kid who is burdened by his parents’ death, and is unable to move on from that grief. Grief makes people do things, different. Grief cracks open your soul and makes you re-question your very being. Yes, Batman cracked, he killed. But he didn’t stop being Batman. He re-evaluated what it was to be Batman. 9/10 times Batman will realise that killing bad guys isn’t the way to go. But you can’t expect someone with as much complexity in their emotional being as Batman, to not fault once in a while. It doesn’t stop him from being Batman, it just makes him human. What are your thoughts, does it make a difference if Batman kills? Let me know in the comments below! I think that as a general rule, vigilante heroes shouldn’t kill. There is something deeply disturbing about the notion that there is someone walking through the streets being judge, jury and executioner in all. This is not a hero. This is an anti-hero. And it is fine to explore and anti-hero, but then you don’t have Batman, you have the punisher. Is it possible to write a story in which Batman does kill? Sure, if this conflict is the centre of the story, the theme which is addressed. If it is established that Batman doing it is a departure from his ideals, not something he thinks is okay to do. That’s the problem with Batman vs Superman. There is no drama in Batman killing because we don’t know anything about this version of Batman. Not to mention that the way it is framed it quite toxic and extremely questionable in its messaging. 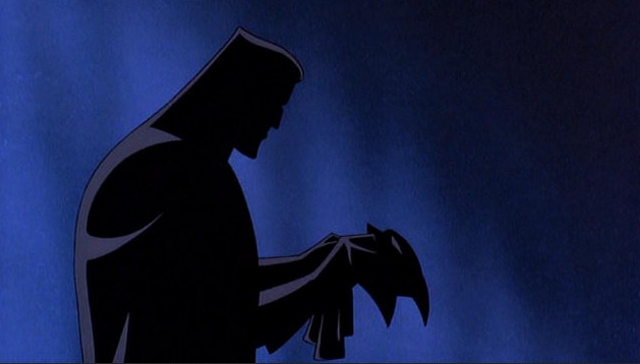 To be honest I’ve never seen Batman as a cut and dry Hero, to me he’s always been an anti-hero which is why he’s the Dark Knight and not the White Knight. The fact that he goes around literally putting petty criminals in the hospital is testament to this, not to mention his decidedly unhealthy obsession with fighting crime, and his frankly toxic relationships with his bat family because of this. As for Batman vs Superman, I think the fact he kills is heavily inspired by Earth-51 Batman, who started killing after the death of Jason Todd. I also think that it was meant to be shocking and make us question him, we meant to see he was a Batman so far gone, so tired of the constant battle that he breaks his once-firm moral code to never kill, which I think gave more power to the way Superman brings him back to the light and gives him hope once again. Oh, I know what we are meant to see, but it doesn’t mean anything if you don’t establish the Batman this version was beforehand first. It also doesn’t work, but why Batman vs Superman doesn’t work is a long, long essay in itself. Yeah completely agree, him killing worked in that story and gave way for his acceptance of Superman! Did they? Put yourself in the shoes of the general audience, most of which have never read a comic book in their life and have at best seen whatever animated superhero series run when they were young. Would anything in the movie make sense to you? I am not so sure about it…after all, all movie versions other than Adam West have killed people left and right…. This is why I stopped reading the Batman book quite some time ago. The decision to turn the Joker into a mass murdered who has killed thousands of innocent people and who it is impossible to ever keep locked up was a really bad one on the part of DC Comics. It makes Batman, and every other superhero, not to mention the entire criminal justice system in the DCU, look like imbeciles who are utterly incapable of stopping one guy from going on an endless killing spree. Also, it really annoys me that Batman is presented as some sort of tactical genius who has contingency plans for defeating every single member of the Justice League, as well as Darkseid and all the other New Gods, but somehow he just can’t figure out a way to keep the Joker locked up. Obviously the REAL reason why Batman can never kill the Joker or find a way to imprison him permanently is that the Joker is a hugely popular, iconic villain, so of course DC doesn’t want to remove him permanently, or even for an extended period of time. I understand that, but I wish that the powers that be would significantly dial back the Joker’s atrocities, so that everyone doesn’t look like a moron for not being able to stop him. Anyway, that endless run-around with no end in sight is a major reason why I eventually outgrew both DC and Marvel’s superhero titles. Yeah of course, getting rid of the Joker completely isn’t really an option for DC. And the longer they can, the more ridiculous the story arcs get. I still enjoy it though, because its comics and its allowed to step away from the realism and get a bit whack. Watch any Batman movie from Keaton to Affleck and for some reason they all kill criminals. Across the decades and the hands of many artists, it is virtually impossible for the character of Batman to be treated the same across the board. Yet his resolve, his choice to not kill, has been widely, though not universally, present. I may not agree with it, but it’s been a defining aspect of him for as long as I can remember. And you are correct, the many failures he’s faced could break most men, but that’s just the thing: Batman isn’t supposed to break, and the version we see in BvS is quite decidedly broken. This is actually a bit terrifying, as he racks up a body count so cavalierly, he tries his best to kill Superman, and he doesn’t even hesitate to put Lois Lane in danger when Superman lashes out after his resurrection. All of these are extremely out of character, but, then again, the DC movies barely resemble the comics in the first place. The Joker, for instance, a crime boss? AND he actually gives a crap about Harley? No, definitely not true to the comics. Thus, it may be disappointing but hardly out of the ordinary for the DC movies to have a Batman who actually blinked when he looked into the abyss and the abyss looked back. I don’t know if its necessarily true that Batman isn’t supposed to break. I think the interesting thing about Batman is that he will give off an image to everyone else that he is always prepared and fearless for anything. But internally he is quite fractured and scared. As for Joker in Suicide Squad, he definitely was more gangster Joker like we saw in Azzarello’s run, but that’s the thing there are so many iterations of these characters, so there isn’t a defining “right” was to portray them. I like your entry this one is thought provoking in the sense does it change who he is if he kills. At first my answer was no but the more I thought about it I start thinking maybe it does. We all in time end up making hard decisions that challange our core beliefs. If we break one of those core beliefs it changes us. After soul searching we realize we need to put in place barriers or guides to prevent what happened to never happen again. Well i think that’s the thing though, over time his beliefs change because of the experiences he goes through. So that inevitably shapes who he is. 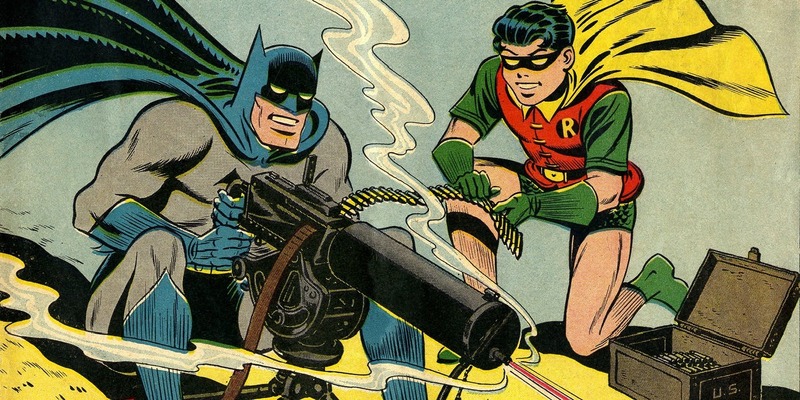 Batman has killed numerous, directly or inadvertently, be it in comics, shows, movies, etc. I think it’s only bad for him to kill if there are no consequences or any effect on him and everything else around him. You look at the Burton/Schumacher movies, he kills people in em, and he doesn’t really bat (ha!) an eye. Heck, he even told Robin not to kill Two-Face, only to kill him later. What a hypocrite! At least in the Nolan trilogy he had to deal with the consequences of letting people die, like Ra’s al Ghul, because there would be people like his daughter Talia who’d want payback. Heck, give Arrow this for all its ups and downs, for all the flak it gets about being a “Batman knockoff”, at least it shows not only Green Arrow’s willingness to kill, but the consequences it brings and how, deep down, it affects him. I guess that’s more of a matter of writing and storytelling, as well as the type of character being used. Sometimes Batman is placed on such a high pedestal that it’s hard to find him relatable, so it can be nice when he’s brought down a peg and has to deal with the fallout.